I feel like I blinked my eyes and all of a sudden, it's July and time for another beauty edit! Where has this year gone? This month's beauty haul is a bit focused on natural beauty since it's summer, the time of year when we want to bare our faces, our legs and get busy having fun in the sun instead of standing in front of a mirror for an hour scrutinizing every part of our hair & make-up. That said, I think we all know that natural beauty for most of us needs a little helping hand... We can't all proudly boast, I woke up like this - some of us need a little help, even if it's only in the form of supplements and great products that make the idea of a no make-up selfie more attainable. Without further ado, here are some products I'm in love with this month for high summer natural beauty. 1. The La Roche-Posay Pigmentclar range aims to solve skin woes like dark spots & dull complexions and these products are fierce! Targeting uneven skin tone, these fabulous products are 100% hypoallergenic and contain no parabens or perfume. Perfect for those with sensitive skin, the Pigmentclar range is lovely, easy to use and each of the products comes in less than the standard 100ml, so they're great to pack in your bag for summer travels. The Eye Contour Smoother is mixed with caffeine and light reflecting pigments to invigorate the skin around the eye and it's among my favorite products ever! The moisturiser is perfect for city girls as it contains anti-pollution protection. Overall, I love this range and I've seen some results from using them including a more luminous complexion and less dry skin. I'd call that a win! Click here to buy these lovely products on sale from Feel Unique. 2. Whether you suffer from allergies, get an accidental sunburn on vacay, have a reaction to a cream, suffer from regular sensitivities or simply love taking care of your skin, you're going to want to have Nu Skin Enhancer Skin Conditioning Gel in your beauty bag. This refreshing multipurpose soother & moisturizer is great for so many things. You can use it before or after shaving, as a lightweight hydrator or underneath your regular moisturizer or make-up. The natural fragrance is lovely and the cooling sensation feels great, making this the perfect product for a first-thing-in-the-morning wake-up call. I find I'm reaching for this product at every opportunity, especially on no-make-up days when I need a boost, if I need a bit of a cool-down or if my skin feels dry and I absolutely love Enhancer worn underneath tinted moisturizer instead of regular day creams so my skin doesn't feel too heavily drenched. It soothes any irritation I have on my face or elsewhere, feels great after a workout and is the perfect post-sun treatment when I get a little burnt by mistake. Nu Skin Enhancer Skin Conditioning Gel is available online via Nu Skin. 3. Beauty from within is one of the big new trends these days and it's not just about food. There's a wealth of supplements on the market these days to help with things like dull skin, hair growth & volume, collagen production and nail health. There's nothing new about this... My granny and mother both used to tell us to eat our Jello (or jelly as it's called here in the UK) for healthy hair and strong nails and various experts have claimed that drinking more water is good for the skin for decades. Historically, women have been altering their diets for centuries and Victorian women even used to drink the water from arsenic springs to achieve a transparent whiteness of their skin, much to the detriment of their health as you can imagine. Thank goodness the beauty from within craze these days is all about optimal health and one of this month's products is the New Nordic Hair Volume Food Supplements. Using a bioactive nutrient formula, New Nordic Hair Volume aims to activate the life processes of hair follicle cells. 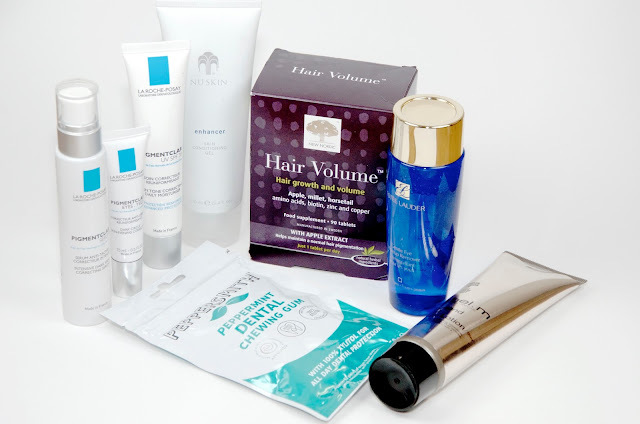 Micronutrients, herbal extracts, vitamins and amino acids, this product also aid in fighting grey hair. Of course as with any supplement, it's wise to seek approval from your doctor prior to use, but who'd have ever thought thick, voluminous hair could be ours for the taking with a simple little daily tablet? Progress is amazing! Click here for more information or to try New Nordic Hair Volume yourself. 4. Over the years, I've come to realize that not all eye make-up removers are created equal. In fact, some are downright horrible while others are amazing. There's no joy in going out for a make-up free day in the sun, only to find you only partially removed last night's mascara and now the remains are running down your face. Yuck! Estée Lauder Gentle Eye Make-up Remover is a star when it comes to taking off hard-to-budge eyeliners and mascaras! Gentle, non-irritating and packing a punch, this is one of the best eye make-up removers I've ever used. Click here for more information or to buy your own Estée Lauder Gentle Eye Make-up Remover. 5. Summer glow is easy with Label.m Diamond Dust Body Lotion... I love this on my legs and arms when I'm baring them in favor of shorts and sleeveless options. Let's face it, every little bit helps on the pale skin of London dwellers and this lotion provides enough sparkle to reflect light, but not so much that it looks like you've been spending the day in Britney Spears's 1990's collection of body glitter. It's not just the name... Diamond Dust Body Lotion is made with real black & white diamonds, pearl dust, champagne and white rose petal oil. It's the ultimate in luxury and will have you sporting a summertime glow in no time! Click here for more information or to buy Label.m Diamond Dust Body Lotion and sparkle, baby, sparkle! 6. I am obsessed with all things dental... After all, it's hard to be a beauty of any caliber with no teeth! I found Peppersmiths Peppermint Dental Gum while I was browsing around Whole Foods and I'm in love with it! It's sugar-free, made with xylitol, super soft (I hate hard gum), freshens breath and it tastes great. Using English peppermint grown on a farm in Hampshire alongside other sustainably sourced ingredients, this gum is sugar-free, but doesn't contain other hot topic sweeteners like aspartame. Sweetened with 100% GMO-free, European-sourced xylitol, Peppersmith's Peppermint Dental Gum is also low-calorie, low-GI, gluten-free and vegan, so you can chew this gum guilt-free! Not sure what xylitol is? It's a low-calorie, natural sweetener found in plants that's often used in foods, medications and oral health products like toothpaste. Xylitol helps to neutralize plaque acidity on teeth and aids in the repairing of tooth enamel. With around 30% less calories than sugar, xylitol has become a popular sugar substitute here in London and elsewhere. Though I was hesitant about any new sweeteners, now that I've learned about its dental benefits, I'm all for small amounts of xylitol here and there. I love this gum and I feel great about chewing it, knowing I'm doing a little something to keep my smile pretty and healthy. Peppersmith's Dental Gum is available in peppermint and spearmint and can be found online via Peppersmith's. What new beauty products are you using lately? Any beauty from within secrets you care to share in the comments below?